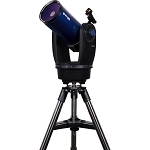 Balancing aperture with manageability and representing the mid-range size in the series, the Sky-Watcher 127mm f/12 Maksutov-Cassegrain Telescope exchanges the conventional front corrector plate of a Schmidt with a convex meniscus lens, resulting in a smaller secondary mirror that limits obstruction and increases contrast, while eliminating the need for periodic collimation. 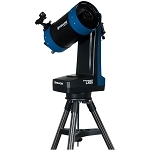 The Maksutov optical path results in a slower focal ratio and narrower field of view versus a similar Schmidt, but the optical benefits, when coupled with the larger aperture and fully multi-coated optics, make this an ideal scope for making detailed solar, lunar, and planetary observations, while being able to resolve bright deep-sky objects like stars, clusters, galaxies, and nebulae. 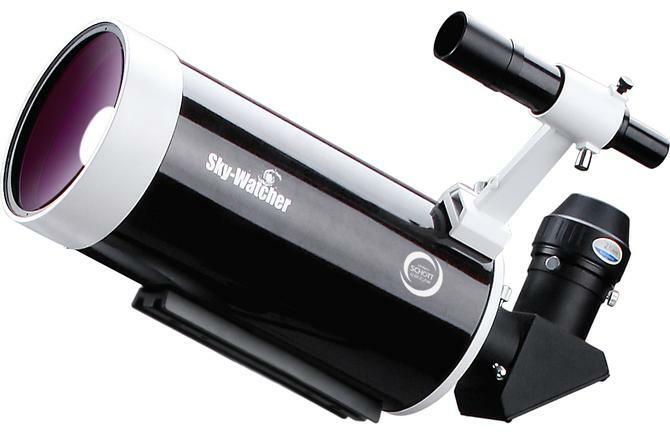 The scope is outfitted with a large 2" visual back and, to get users started, Sky-Watcher includes a 28mm long eye relief eyepiece that produces a moderate magnification and a 90° star diagonal for more comfortable viewing when the optical tube assembly (OTA) is pointed at or near the celestial zenith. 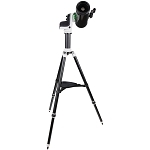 The OTA is offered here without a mount or tripod for users who have a platform or want to use it as part of a dual-OTA setup for star parties or observation/imaging rigs. It is outfitted with a Vixen-style dovetail plate for easy attachment onto many mounts. 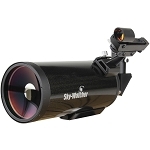 This OTA's compact form factor belies its observation power and resolution and is ideally suited as a grab-and-go option for quick observation sessions or heading out to remote locations. Box Dimensions (LxWxH) 28.1 x 9.7 x 9.2"